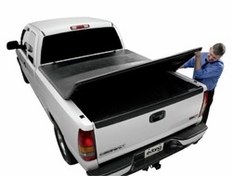 A good tonneau cover is a must for the truck enthusiast. Why should you buy a truck bed cover from us? Whether you're looking for a truck bed cover for the protection, the looks, or the gas mileage increase (bed covers are proven to pay for themselves over time by increasing the aerodynamics of the vehicle and improving gas mileage by as much as 15%), we've got you covered. We carry all of the top brands of truck bed covers in stock, meaning we can cover your truck bed with a variety of different types and styles of covers. No matter what kind of tonneau cover you're looking for we have the solution. Looking for a folding tonneau cover? We've got it. Looking for a soft tonneau or roll up bed cover? No problem. Retractable truck bed cover? We've got those too. Don't worry, we've got your truck bed covered.